After living in Texas nearly all my life, I am experiencing my first real winter in Boulder, Colorado, and I am woefully underprepared. At the first signs of the coming gales and frigid temps I did the stereotypical Texan thing and bought the biggest, cheapest jacket I could find at Target. One tricky thing about getting outside and running around in cold weather is snow, ice, and slush. Before I moved to Colorado, my idea of snow came from movies and commercials that featured blanketed white fields or uniformly covered mountains that were feet deep in the stuff. While those conditions do exist, that’s not where the fun is, at least not for me. I’m a trail runner and I want to get out on the trails, wheeze up steep climbs and bomb the technical descents that I’m used to, albeit through the rosy-white sunglasses of winter. The snow on these trails gets stepped on, rained on, sunshined on, melted, frozen, melted again, refrozen, you get the idea. If it’s been pretty warm there may not be much of any snow on the trail, just the occasional icy patch. You don’t need snow shoes or anything designed for flotation, you just need something to keep you stuck to the ground when the going gets slippy. 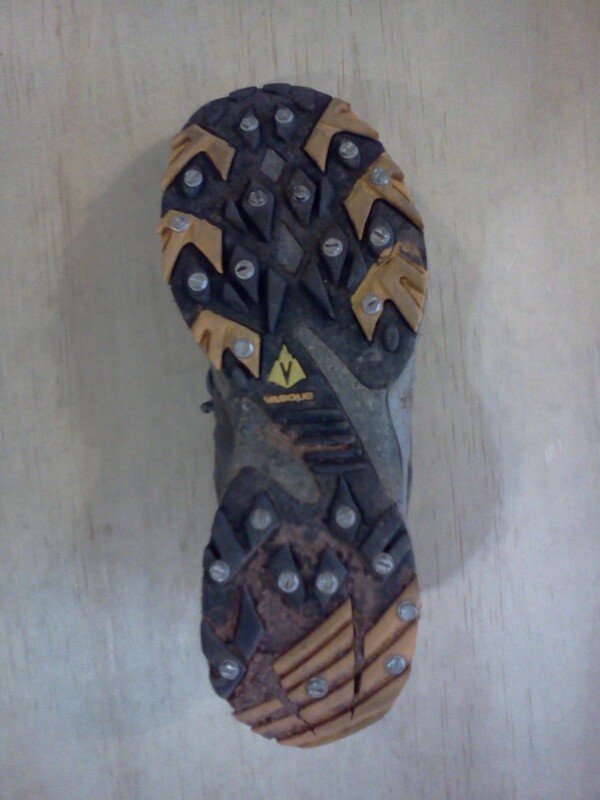 I tried some YakTrax (YakTrax XTR to be exact. I assume the XTR stands for “XTReme”, probably a good choice if I decide to street luge down Fern Canyon.) Anyway, they were lousy. They slipped when I tried to apply power going uphill, and they pinched my feet on the downhill. I think they may work better for big stiff hiking boots, but they did not work well for trail running. To be fair, they are work fine for their intended purpose of hiking, but I really like taking descents aggressively and pushing myself on the uphills, and they were just not up to that kind of usage. Enter shoe screws. 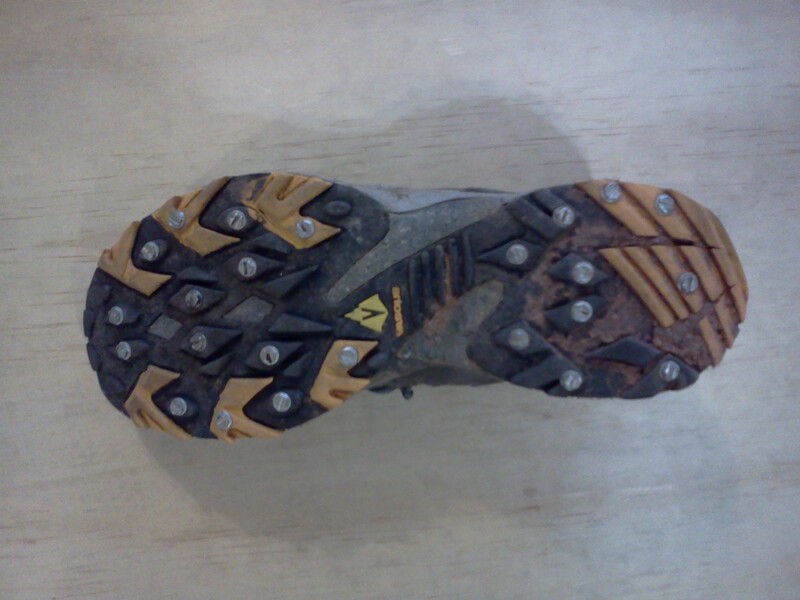 I read and re-read and then forgot most of Matt Carpenter’s article on shoe screws at http://www.skyrunner.com/screwshoe.htm, then finally decided to go for it. My hardware store of choice has a million 40-foot tall rows, but only one half-row dedicated to screws, and they were missing the recommended screw length, so I made the crucial mistake of using 1/2″ screws instead of the 3/8″ screws. Ouch! The 1/2″ screws are fine in the heel area but not so great on the forefoot of thin-soled running shoes. Ouch! Not in the middle! The screws put a hole in my only pair of waterproof socks, and I had to spend a half hour unscrewing the worst of the little suckers on the side of the trail, but eventually I made it to the top of Green Mountain with them, then jogged down. They worked pretty well, except for the part where they stabbed into my feet if I stepped on a rock wrong. Traction was great, no slippage, no pinching, they just worked, and they were hardly noticeable on the pavement. 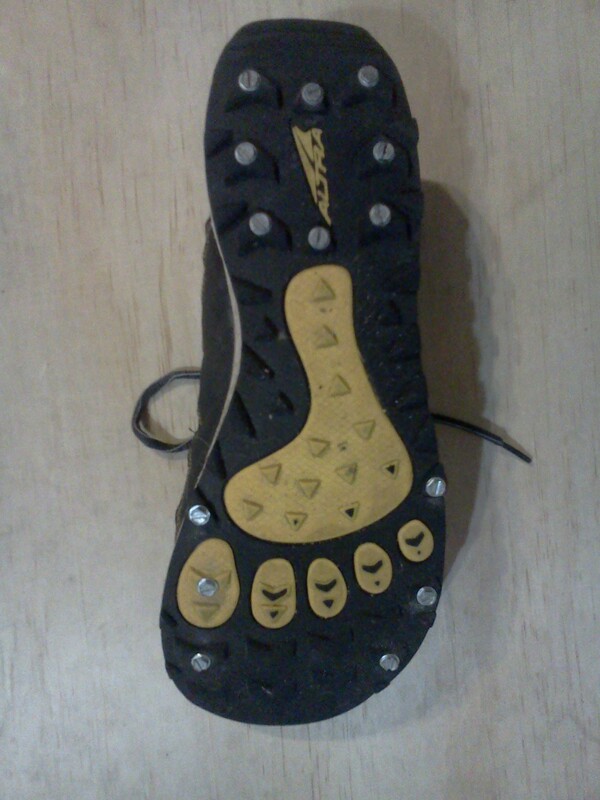 I later mail-ordered the shorter 3/8″ screws and installed them only on the perimeter of the shoe. This definitely helped ease the iron-coffin effect, but I can still feel the screws there on any kind of technical rocky terrain. They are like an anti-rock plate, in that they magnify whatever pointy bits you step on. I would go out on a limb and suggest that for technical trails, shoe screws may work better on thicker, stiffer soles, rather than the lightweight Altra Lone Peaks that I applied them to. Ahh, much better. Putting the screws only on the perimeter protects against slipping, and won’t create too much pressure in the middle of your foot. 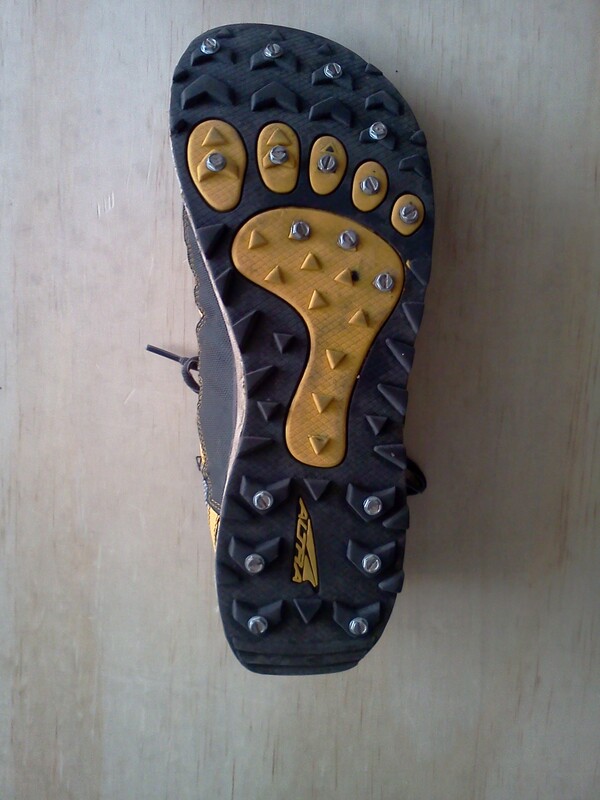 My screw-studded Lone Peaks may not be ideal for rocky, technical trails, but they work great for snowy, icy non-technical trails and pavement. Since the tread on these shoes was getting worn down anyway, the screws have really given them new life. I have an old pair of heavier Vasque trail running shoes that I’ll try next. These shoes are thicker and stiffer in the sole, so I’m hoping they’ll work a little better on the rocky stuff. Overall, I’m really enthusiastic about how well the shoe screws worked, and I can’t wait for some more snow so I can try some different variations. Winter is way too beautiful to spend next to a fireplace. 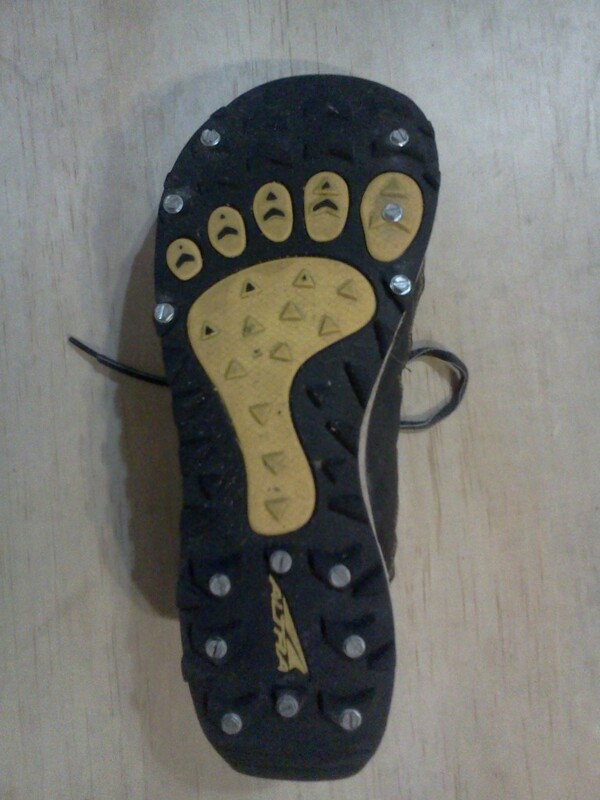 I applied a lot more screws to the forefoot this time and I noticed a significant improvement in traction on icy slopes, although I still found myself slipping on the steepest, iciest slopes. The stiffer soles did prevent the screws from poking my feet, but the screws seemed to transmit a lot more shock to my feet than I’m used to, and over the course of the 4 hours or so it really added up to a lot of foot fatigue. I was really glad to get home and take them off by the end of the run. One other thing to note, it seems like the extra screws translated to more noticeable drag on pavement. I think the strategy of putting the screws only on the outside is probably the best compromise. 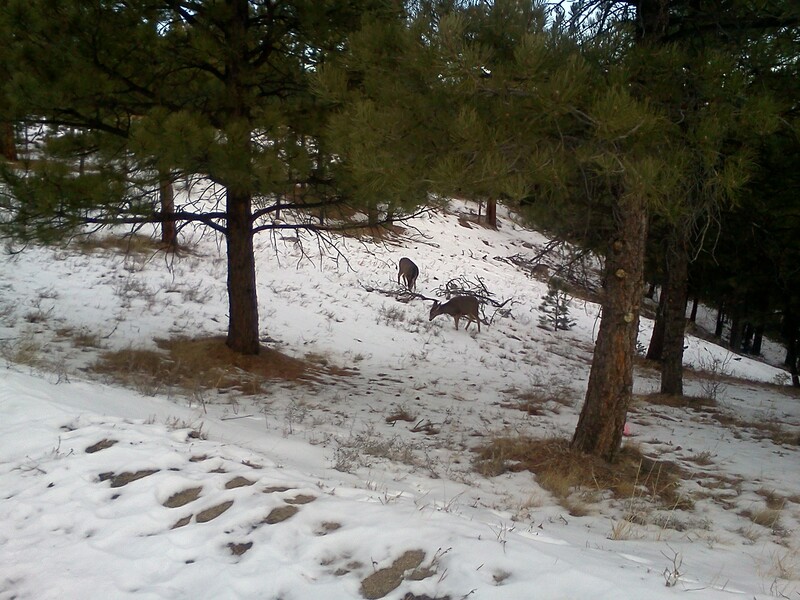 This entry was posted in athletics and tagged cold weather, gear, shoes, snow, trail running by admin. Bookmark the permalink.